Summer Zoe, my youngest, is graduating this December. Let that sink in for just a bit. MY BABY is graduating college. I'm officially old as dirt. And I'm hating every aching minute of it. But back to the blog. 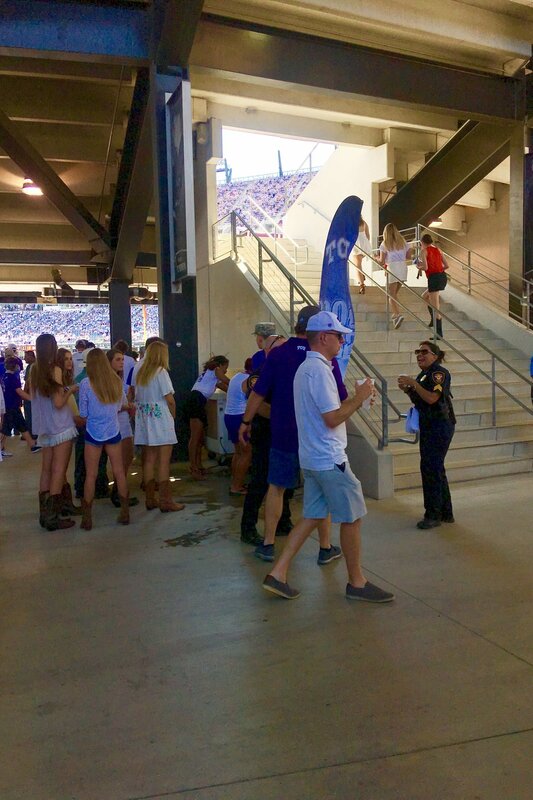 I've only been to one TCU football game. That's just wrong. I mean, they all think I love the Longhorns best and then to only have gone to one football game? Shame on me! I'm simply proving their point because I've been to several UT games. Please forgive Hornfrogs. I love you as well. You just come with a higher sticker shock, that's all. And no Matthew McConaughey. But that's not your fault. I'm sure there is alumnus in your archives that are just as cute. Right? The weekend was filled with fun! First of all, it's Parent's Weekend. I hung out with her roomies and friend's parentals and enjoyed them all. Apples don't fall far from trees, so good chance that if you like the kid, you'll like the parent. I did! They were all fun and pleasant and just lovely people. Since she's graduating, we also photographed her senior portrait. Got her "grad on" we like to say. We stayed on campus which is gorgeous and no I have no excuse to get her announcements out quick. The game was hot and sweaty, but still fun and I learned a thing or two. Those TCU Showgirls? After the game is over those girls kicked, as in HIGH KICKS for an entire AC/DC song. I witnessed it and watched. You try kicking above your ear for an entire AC/DC song without any liquor. Just try it! Super hard and I realized then, that all those times I made fun of them in the past? They completely redeemed themselves. BRAVO, showgirls! After the game, we went to the food truck court. Let me rephrase that...after the game and a quick shower to wash off the sweat from our bodies, we went to the food trucks. We met some friends there and enjoyed the evening getting to know each other. It was fun! Then we made our way back to bed and I stayed up watching the UT USC game. HELLO! Great game! Double OT even. Matthew on the sidelines getting excited. Vince Young there as well! BUT dang it! They lost. USC dropped in the rankings today and TCU hit 14, but it's such a sad loss. It would have been amazing for them to beat them!!! The next day, we went to mass together, then lunch at my favorite place HG Supply. If you ever get close to a location, GO. Just GO, Everything I've ever had there is AMAZEBALLS! I love that place!